A Gourmand is a connoisseur of good food. Someone who takes pleasure in exploring different combinations of ingredients and flavours. He is passionate about food, wine and everything that surrounds it. He enjoys going out and discovering new food heavens, whether a trendy restaurant, a local market or a new recipe. He will always be surrounded by the best company. I am Teresa la Maltesa, born in Malta 25 years ago, of English & Spanish nationality. A law graduate, a Gourmand and a Traveller. The Gourmand Traveller was born in Italy as a way of documenting life’s adventures through food and travel. Life has since taken many different turns, the blog remained open but with prolonged periods of silence. It comes back today under complete different circumstances, yet hoping to preserve and further develop its unique essence. Brussels, August 2012. Dinner at BelgoBelge, picture by Cansu Gunel. Tell me about yourself. Enjoy your weekend!!! thanks for stopping over at my blog!! Love this site…your blog makes me want to go pack my bags and eat my way across someplace I’ve never been! Thank you Lorrie!! what a lovely comment! Have a nice day! It is a nice day, and thank you so much for the ‘follow’ too! All the best to you!! I’m looking forward to hearing about your adventures! (wish I was you!!) 🙂 Thank you for visiting my blog. You have a very lovely blog. Thank you for visiting allthingsyogi.com! There is nothing better then local and high quality food. We are what we eat. Thanks for sharing your passion. I think the best folk have a good mix of nationalities and backgrounds! 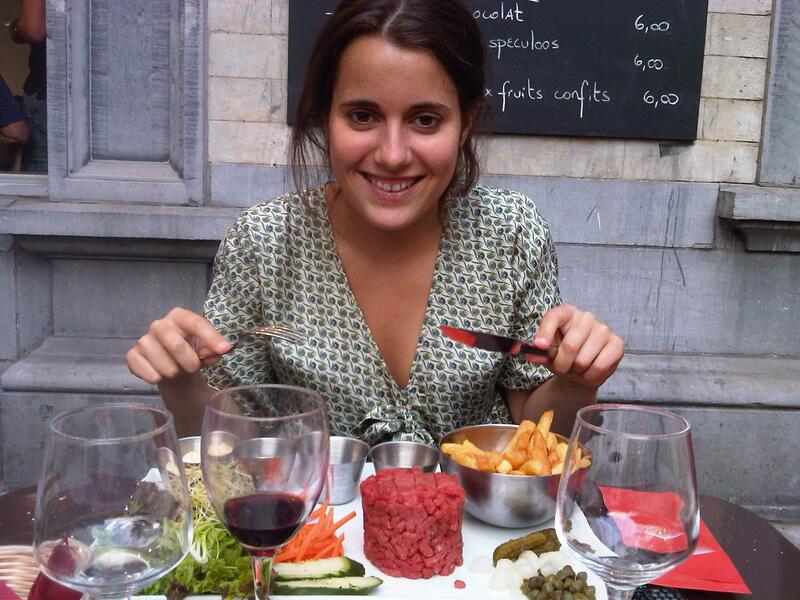 And is that a steak tartare you are eating here – it looks amazing! I forgot to answer!! thank you for nominating me, your blog is great congrats! Thank you!! That is a really nice thing to say and to do :D. Love your blog to! I’m so honored when an omnivore likes my blog, you and your food are beautiful! Thank you for liking my latest post. I really enjoyed discovering your blog. I am now hungry and willing to visit Italy! Hi Teresa, thanks for following http://www.delightfullyitaly.com! And, by the way, I’m really enjoying following your blog! Thank you! I love your blog tooo!! A great photo!! You look happy. PS a nice dress (or is it a shirt?)! I visualized it somehow as a dress, but anyhow, it looks very stylish! Thanks. I like yours too. Lovely, appealing photos. Thank you! I really liked your blog to! My kind of blog…love it..love your style too…. Nice blog 🙂 and thanks for stopping by mine too. What a lovely blog, did I tell you already? I love that you are both a gourmand and a law graduate! You need one to do the other! Adorable photo of you here, too, with lots of yummy foods . . . I see tartare (beef? ), potatoes, cornichons, capers, onions, maybe some condiments such as mayo and mustard? Can’t wait to catch up on your blog!!! What a sweet comment! Thank you! Can’t wait to discover more of your blog! Thanks for liking my blog- yours looks really great! I am also a great fan of Bologna (I come from Cesena- not too far away!). Hey, thanks for liking my blog! Yours is great! Are you located in Italy? I want to try that burger restaurant you wrote about and can’t figure out what city it is in. Drool! Thanks for the like..love your blog! Your blog is amazing… congrats!